Where did thoroughbreds come from? Why do they call it a steeplechase? What's the difference between trotting and pacing? Did you know that winning jockeys are weighed before and after a race? Experienced horsewoman Nikki Tate takes the reader behind the scenes to examine the world of the racetrack. Sections include: The history of horse racing from chariots to chuckwagons; An examination of the racing breeds from thoroughbreds to quarter horses; The role of the trainers, grooms, farriers, track vets, pony riders, outriders, and paddock judges; Care of a horse at the racetrack; Horse equipment; The jockey's training; What goes on in the racing office; How to read the program; How the starting gates work; Drug use and cheating; and A horse's life after the racetrack. 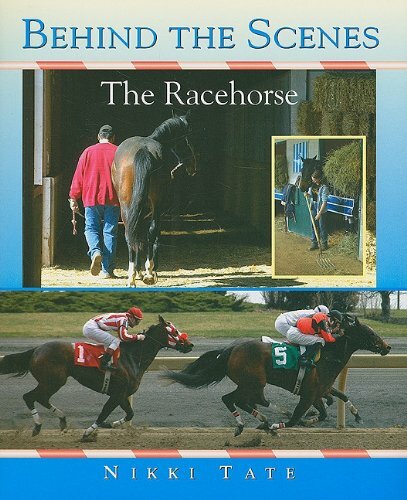 An examination of horse racing from a history of the breeds developed for the sport, through training and caring for horses at the track, to the day of the race and beyond.